When I first saw this round go up, I was intrigued primarily for the logistics aspects of the Forerunner Capital. 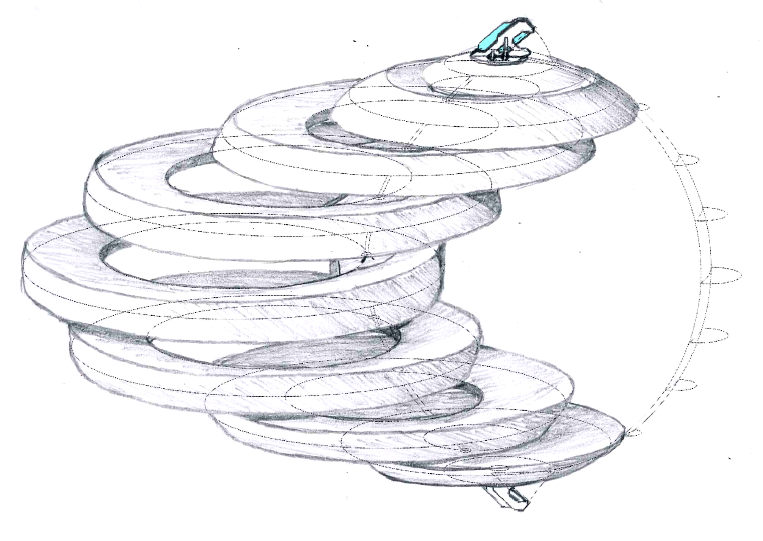 A sphere-shaped construct which can re-align into a spiral form. Yet, when spherical, it would need to be feasibly defensible, and still have a very Forerunner-like style. So I started with a concept, and attempted a few minor variants to see what would be practical, and hopefully believable. Below is the basic skeleton I decided to run with. 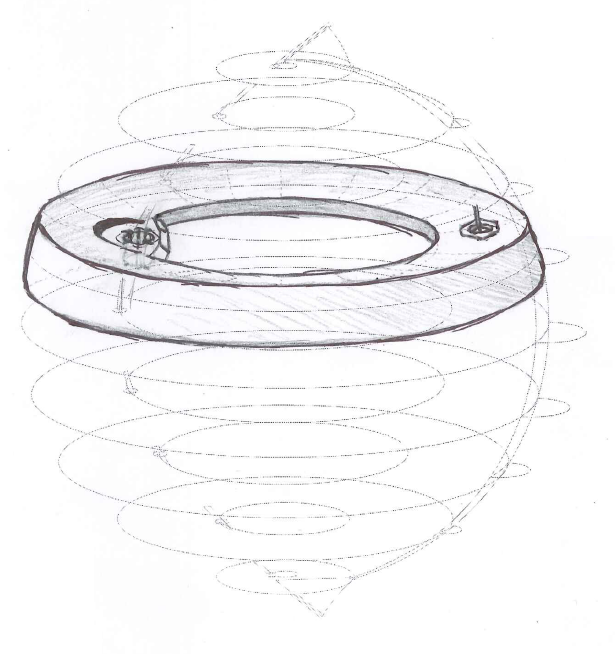 The "central rod" I interpreted as an arc-shaped beam around which the concentric discs of the capital could pivot. Being curved meant that the pivot point would be off-center, and when spun, the discs would produce a spiral-shaped pattern. I went with 9 discs (including the N and S caps) so they would rotate each at 45 degree increments and the caps could remain fixed. The initial design of convex discs wasn't sitting well with me, so I converted them to concave - and this new shape would produce what felt to be a more defensible and obvious sphere, following in the Forerunner style of constructed planets. I liked this - that the Forerunner Capital would be another type of planetoid construct. For my next step I filled out the sphere, sketching its defense alignment - but leaving out what I initially envisioned as a sort of external 'latch' arc that would lock the discs in their defensive position. And then doing the same for the open alignment. 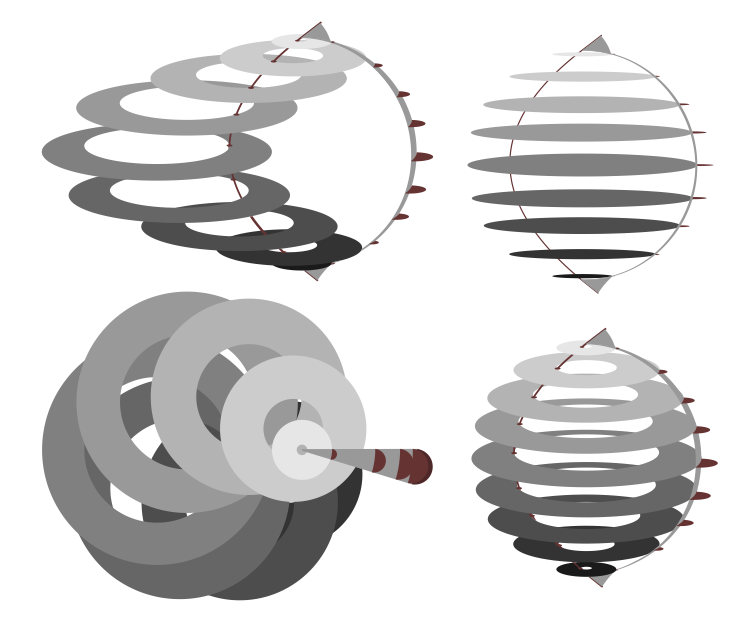 It's hard to see the real spiral-like shape from the angle I sketched it, but the concept version up top indicates how much of a spiral the arc rod would produce. And by massive, I mean massive. That thing would have to be strong, hard, powerful... after all, it's chaining together 9 disc shaped structures each the size of planets ranging from Earth mass to near Jupiter diameter. Not only that, but how would an arc-shaped central beam allow for horizontal pivoting of discs with each connected to the beam at a slightly different angle? At a position that felt strong and balanced, each disc would have an upright shaft through which the beam would be channeled. That shaft would be lined with 6 guide ridges constructed to reflect the proper angle of the beam in its place. This forces each disc to only find its proper vertical positioning (effectively locking them in) at the point where the beam fits snugly in its shaft. The guide ridges are of course Forerunner tech that acts sort of like an electromagnet, directing the hard light through the shaft's core, and constantly monitored to ensure zero disc tilt along the beam. Each disc shaft is constructed as a uniform round channel that can rotate on its Z axis, allowing its disc to rotate between the open and closed formation, while keeping the central beam structure consistent. Having a hard-light core also allowed for more Forerunner-like pole caps - the massive reactors that produce the hard light core itself. Next up was a little tweak that I thought would strengthen the defensive orientation even further. 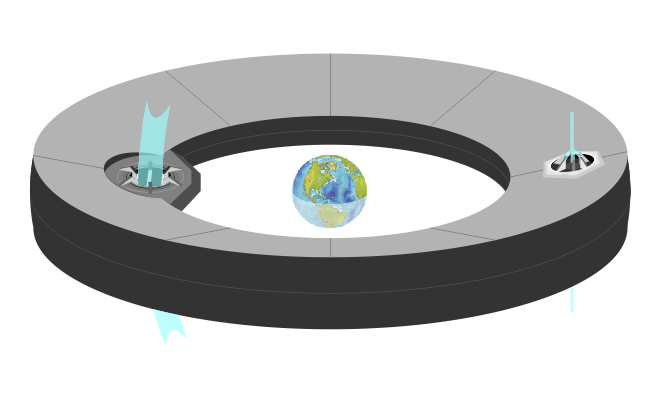 When each disc is aligned in the sphere, beam emitters on the opposite end of the discs would emerge and being aligned perfectly with each adjacent disc, they would connect via another hard light link. Here though, each link between discs would be independent, providing a more segmented connection opposite the single core beam. 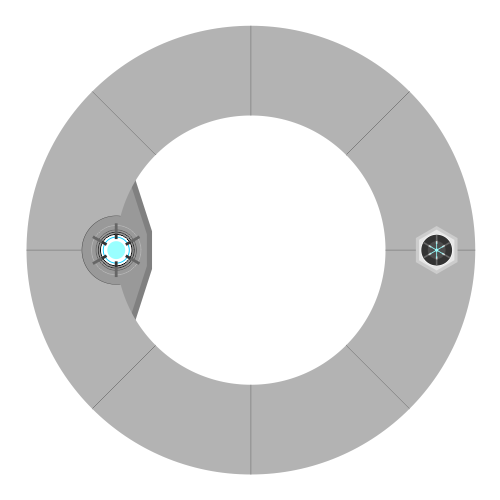 One adjustment for additional defense strength could be to have two links opposite the core to provide a tripod-style support between each disc. Satisfied with the relatively basic skeleton for the Forerunner Capital, I did bit more of a graphic finalization of the central disc, including the relative size of Earth for scale. 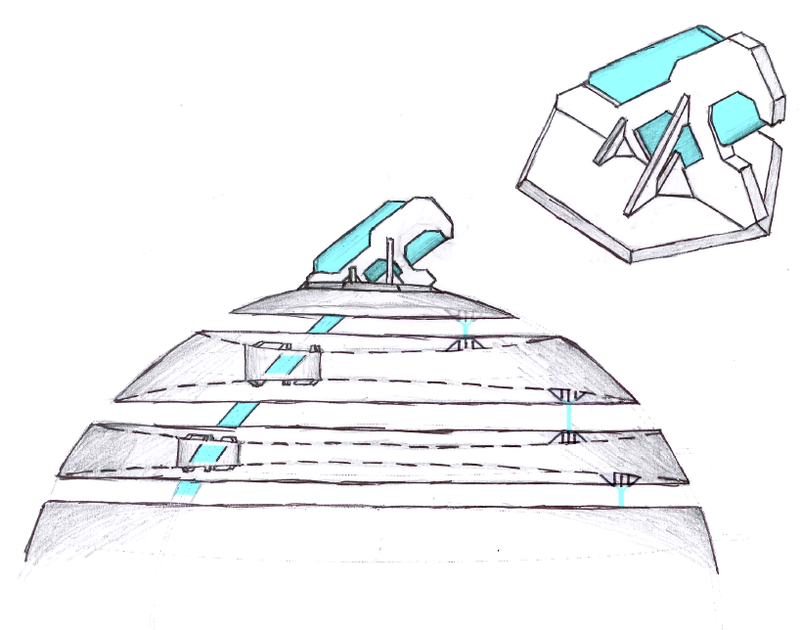 * Presuming the hard light core is bright, and some Forerunner beings do might prefer the option of darkness or "night" cycles, each inter-disc segment of the beam could also be surrounded by day/night shade cylinders. 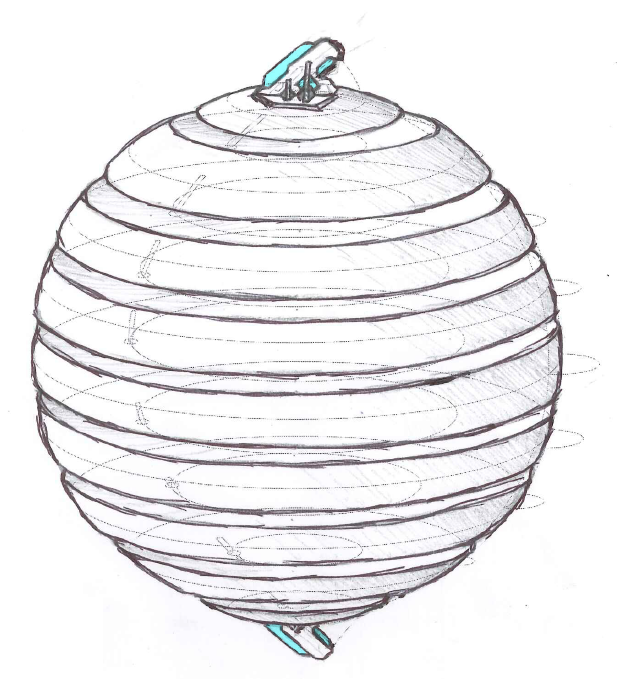 * External to the main sphere shape, additional rings or platforms could orbit for more protection or added utility, networking, transit, etc. * When aligned in a sphere, the inside of the construct is itself a spherical void. I imagine the Forerunners able to use this space to organize and commission fleets of vessels, protected by the defensive capital sphere. Or perhaps using the inner spherical void to open black holes or slipspace wormholes and whatnot. * I also realized the caps appear like they would produce a more flattened beam, and less of a round cylindrical arc as implied by the pivot shafts. I do like the idea of a wide, flat beam passing from north to south, and it feels like it would provide a little more horizontal positional integrity.